To the extent that a 30-year-old, record-breaking cultural touchstone needs saving, it’s the writers who are going to save it. Partly, that’s because all the other pieces are in place on The Simpsons. There’s a generational acting text to be written about the way the series’ core voice actors have approached and refined the central characters’ three-decade journey of evolving but necessarily static characterizations. Sure, Harry Shearer’s chapter will unavoidably include phrases like “under duress,” but that can’t obscure the fact that this is a uniquely great cast. 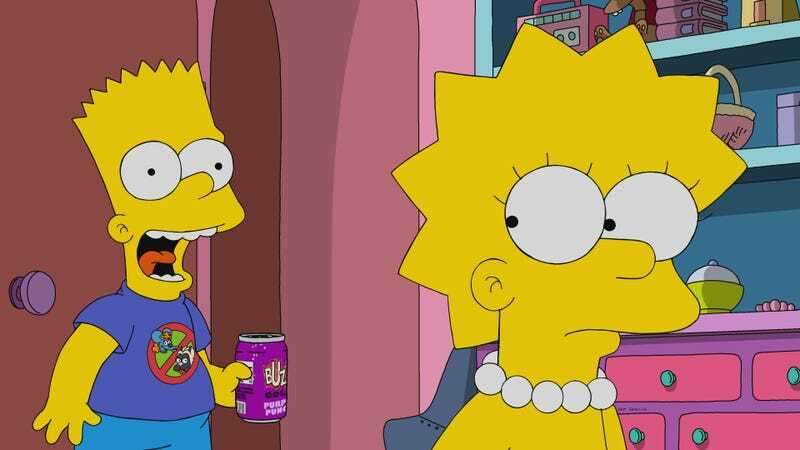 And as far as TV world-building goes, The Simpsons’ Springfield is itself an endlessly rewarding petri dish of comic ideas, its garish approximation of our decidedly more mundane (but no less ludicrous) world a magnificently constructed and reinforced template for comic creativity. And if The Simpsons isn’t the fundamental force in American comedy that it was when (insert your demarcation point here), those pieces are still bright, and viable. They’re just waiting for the right writers to pick them up and assemble them properly. This is all preamble to the fact that “Bart Vs. Itchy & Scratchy” is the first credited script by Megan Amram. One of the most reliably original and hilarious sitcom minds working today, Amram’s been a “consulting producer” on the show since 2018, covering some 10 episodes, according to IMDb. And while those quotation marks are meant to question how much influence Amram has had before now, her work on series like Parks And Recreation, Kroll Show, Childrens Hospital, The Good Place, and her cheeky, self-promoting series An Emmy For Megan (not mention her justly famous Twitter presence) understandably contributed to my raised expectations. And this long-winded introduction. “Bart Vs. Itchy & Scratchy” is The Simpsons’ take on the continuing controversy surrounding gender equality in genre entertainment. And if that description—considering the show’s response to some other recent conversations about inclusion and representation in Hollywood—has you rolling your eyes, well, understood. With that response to criticism of its own place in the pantheon of questionable portrayals and attitudes in comedy eliciting everything from smug “Then why are we in our 30th year?” defensiveness to outright mockery of those suggesting that, maybe, the longtime guardians of The Simpsons’ legacy might have a few blind spots with regard to underrepresented voices, some eye-rolling, deep sighing, and prejudgement might be expected. 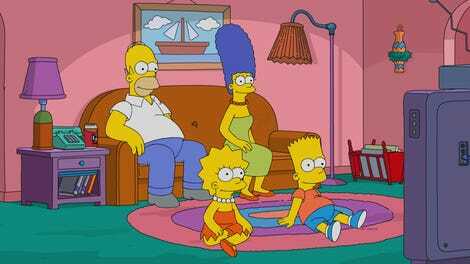 The story starts with another Springfield Comic-Con, where the family sits expectantly at a Krusty panel, where America’s most checked-out entertainer dutifully spits out bored platitudes that sound suspiciously like The Simpsons’ own response to questions about the next Simpsons movie. (“We’re waiting for a story that needs to be told,” murmurs a dead-eyed Krusty, continuing, “so we can copy it and call it a parody.”) The only thing that perks the money-loving Krusty up is his announcement that he’s rebooting venerable cartoon bloodbath segment “Itchy & Scratchy” with an all-female cast. “Oh my God,” blurt both Lisa and Bart, their diametrically opposed enthusiasm levels presaging the cultural shitstorm about to descend on Springfield. The way in which fandom has bred a subculture of sneering little manboys who greet every perceived entry of a woman into the genre clubhouse with a flood of online harassment, misogyny, and hashtagging media manipulation isn’t news, apart from, say, a fine pop culture site having to sigh deeply while dutifully reporting on and trenchantly analyzing the latest attempts to tank online critical scores and (impotently) harm the box office. And Amram’s just the person to do it, which makes the result here something of a disappointment. But Lisa’s not blameless in her own particular culture war, something that the script plays around with knowingly. Lisa’s awfully quick to buy into Kristy’s slapdash faux-feminism (the new Itchy and Scratchy are just Itchy and Scratchy with wigs and frocks, the show’s theme song hastily ADR-ed by Krusty), just as she’s quick to pile on her big brother in her triumph. She taunts Bart with being “trolled, GIF-ed, memed, and, dare I say it, pwned” on the way to school after his online humiliation, and fairly floats on her newfound belief in the progress indicated by a crude cartoon’s cynical new coat of paint. Milhouse, too, is vehicle for some surreptitiously smart analysis of the whole aggrieved manboy fandom phenomenon than, say, calling such people “aggrieved manboys.” For the perpetually emasculated Milhouse, Nelson’s accusation that Bart “betrayed his wang” by daring to laugh at the new Itchy & Scratchy gives him the innate bullied’s instinct to seize upon an opening to become the bully. Hearing himself praised for calling out Bart, Milhouse’s inner monologue is a sad, not-unsympathetic working through of male opportunism, egotism, and fear, with his careful self-admonition that the next words out of his mouth will determine whether he gets to join the alpha-pack for good emerging as the all-to-simple command, “Get him!” For the put-upon, lonely, and disregarded Milhouse to glimpse the unthought possibility of true peer power is awfully insightful, as is his realization that the only solution is to howl in ginned-up outrage and point fingers. The silly joke that he creates his own MRA youth auxiliary (unfortunate acronym BRA) comes with queasy echoes of where such furiously frustrated white male victimhood can lead, as he rants that the world is trying to “erase” them. So far, so promising. And if Bart’s dalliance with the group of sixth-grade girl rowdies (voiced by Nicole Byer, Chelsea Peretti, and Awkwafina) delves into the episode’s themes with similar smarts, it’s also as largely lacking in big laughs. After Bart flees the Milhouse-led mob into the girls room, he sees that the tough girls (donning knit ski masks and calling themselves Bossy Riot), are already deep into their own Bart-esque rampage of petty vandalism, although they assure the infamous El Barto that their plans to paint Skinner’s office pink (in response to his sandal ban) are all for the greater good. It’s a choice that derails the Itchy & Scratchy story, even though Lisa’s reaction to her discovery that Bart has joined their (and her) feminist cause allows Amram to poke at Lisa’s own blind spots with subtle sharpness. Angry that Bart is helping Bossy Riot for the wrong reasons (“It’s all about the deets!,” she rages at the blithely “woke” Bart), Lisa is forced to confront some of her own complacency in the very real struggle. And if Bossy Riot’s prankish crime spree (“Eve was framed” reads the doctored sign at the First Church Of Springfield) is depicted here as the half-formed eruption of the very real resentment engendered by the girls’ cultural awakening, “Bart Vs. Itchy & Scratchy” bestows its ultimate approval in the quietly rousing finale. Lisa, despite rejecting Bossy Riot’s rash plot to destroy the (unbacked-up) Itchy & Scratchy master tapes, makes the decision to don Bart’s knit cap and pedal off with the big girls on their own wobbling but righteous crusade. (Lisa’s genuinely trepidatious inner doubts about “pushing my beliefs further than they’ve ever gone” before hopping on her bike is just the Lisa-Amram moment I was hoping for.) And Bart, weaned from his newfound comradeship by the revelation that he was “just kept around for fingerprints and DNA,” yet whips out his pink spray paint and scrawls “The patriarchy is a wiener” on a nearby wall. As Lisa correctly surmised, Bart was acting merely as a “mercenary in someone else’s war,” but the episode finds a lovely, hopeful, and sweetly subversive way to show that both Bart and Lisa learned something important, even in a trifling pop cultural stunt. Bossy Riot props open the tape room door with a copy of Naomi Wolf’s The Beauty Myth. Hey, Simpsons, you leave The Great British Bake Off alone. I’m warning you.